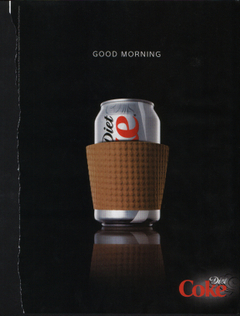 Diet Coke with breakfast, anyone? Just came across this ad in a recent issue of GQ magazine. You don't see interesting magazine ads very often these days, so I had to bring out my scanner and scan it. And so this goes into the "Nice re-positioning" file. At the same time, I am willing to bet that those long early morning lines at your local Starbucks aren't going to be eclipsed by the lines at your office soda vending machine any time soon.